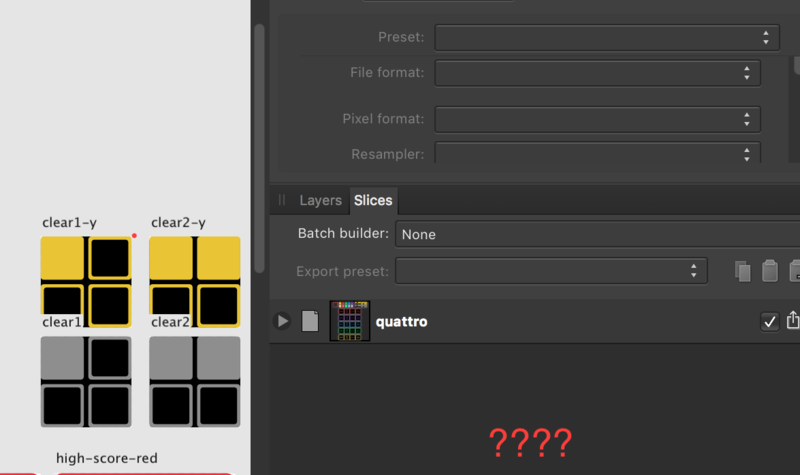 after last update I have a problem - when I create multiple artboards they're not included later in export persona as slices like it was before. There is always the main file including all artboards available and sometimes some random artboards as well (but never all of them). It happens with the different files, I attach a screenshot as a reference. Can someone please help me with this issue? Will be very grateful. Can you zoom out and show me a screenshot of your artboards, please? @Jens Krebs These are multiple artboards, unfortunately. That is strange, I just created a ew document, added art oards and sll of them appeared as slices. Which version are you using? I'm on 1.6.0 on MacOS. If you're duplicating an existing artboard, rather than inserting a new one, then the slices are not copied across. This was an intentional change, that has thrown many people off! It is with development to change back however! I'll get this thread passed on to them. @Sean P Thank you so much for the reply! It's good to hear that it is in development, do you have the information when can we expect this feature back? 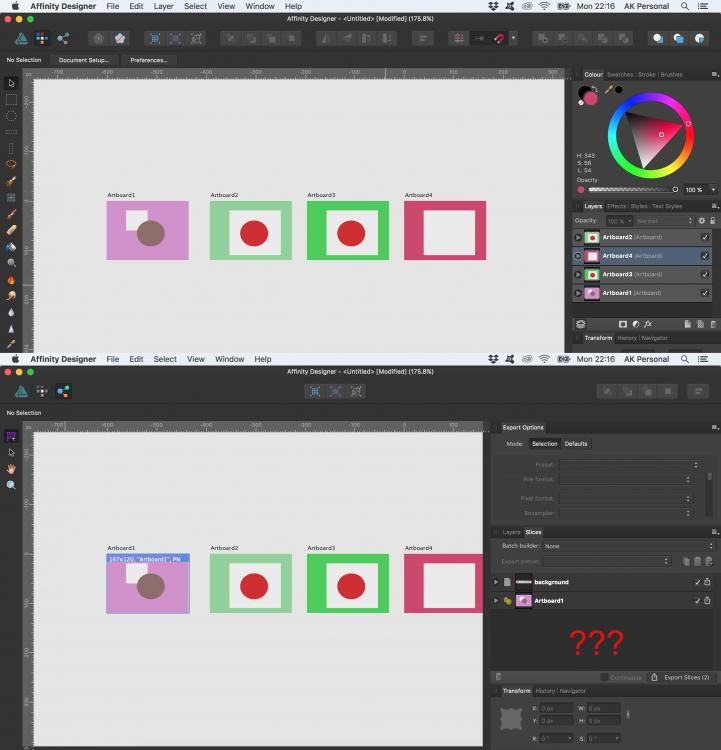 Copying the artboards was extremely helpful, especially in UI design, so it's a pity that it doesn't work. Unfortunately we don't yet have a date, but I don't think it should be too far away! 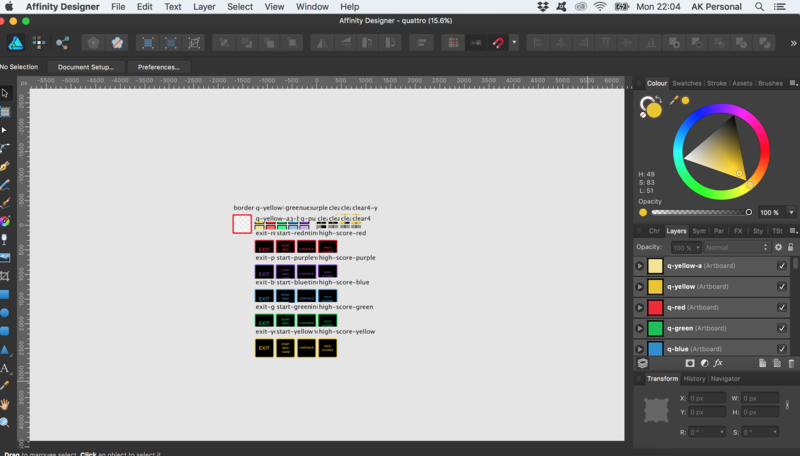 In the meantime in the Export Persona if you select your Artboard in the Layers Panel and click the 'Create Slice' button it will create a Slice sized to the artboard as it would have been previously. Thank you for this tip! I didn't know I can create slices like this, it resolves my problem for now! Just an update to let you know that this issue is already fixed in Affinity Designer 1.6.1 Beta 2 on Mac (and Affinity Designer 1.6.3.98 Beta on Win). The fix will be included in the next retail update for both OS's. @MEB That's really good to hear, thank you!